Learn independently, at your own pace, with the help of our digital learning activities. We help you to make mistakes so you learn from them via unique feedback and worked answers following every question. Sign up to view a sample course and only buy full access if you like what you see. We provide 24/7 access - as long as you have a device and an internet connection, you can study. View and complete activities as many times as you like – we don't limit access. All data is recorded and presented in easy to read reports to keep track of how you're doing. For just £50 individuals can obtain access for up to 2 years. This provides 24/7 access and activities can be viewed as many times as a student needs – we don't limit access. There is no limit on data records. 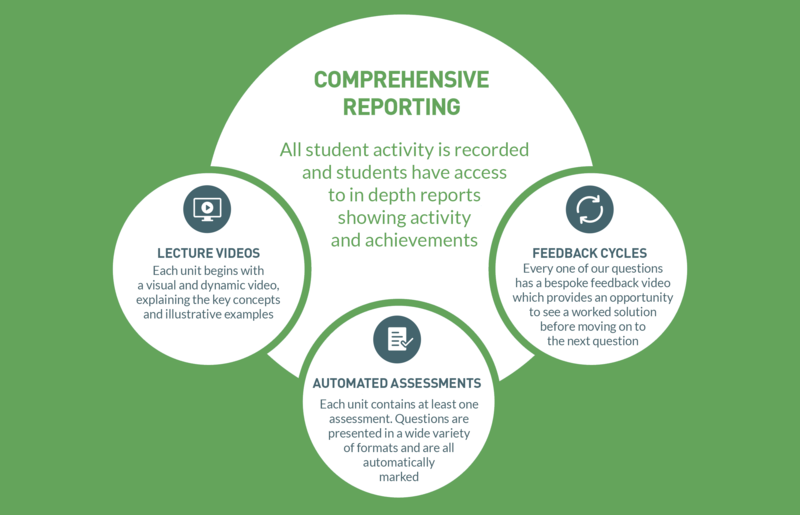 We record every action, analyse it and present the records in a format that helps to progress learning. All without any extra charges. Schools can review course material prior to making any purchase decision. Online opportunities to observe a pre-populated demo account are available for teachers who wish to visualise the game changing data records that will be generated by student activity. A discount will be available for schools purchasing access to multiple courses. Register now, choose your course and start today!